*To watch our update video in full screen, open it in YouTube. 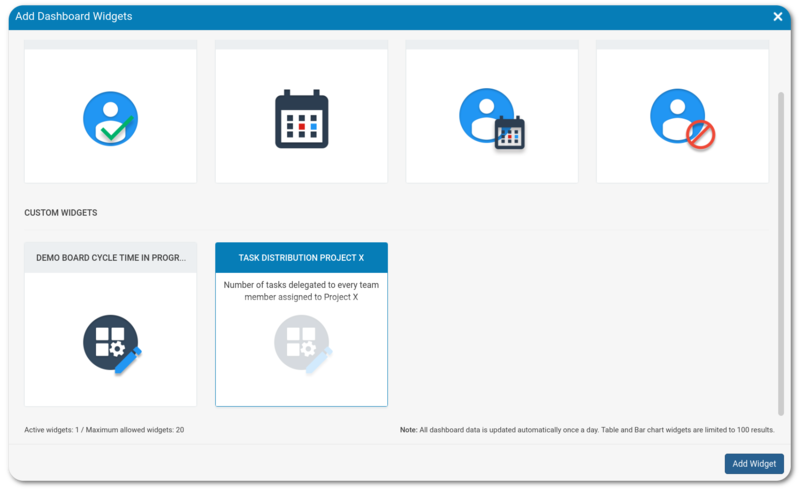 Just a month after the first generation of widgets in Kanbanize made their debut, the ability to create your own customizable widgets in going live in our new update 5.1. As their name suggests, these types of widgets are created by each user to filter the most significant information in their accounts. This information is then pinned to the Main Dashboard display. Set these up using the advanced search and choose the format in which you would like to show the filtered data – as a dynamic table, bar graph or pie chart on your account’s entry point. The ability to differentiate the columns on your Kanban board to represent the queues in your process was a visual addition we created to help you optimize the way you practice Kanban and identify waste in your work. From this release onward, you will be able to categorize a column as a queue or activity (value-adding) and help your team in anticipating potential bottlenecks. The column types are aimed to encourage their working together to decrease the cycle time of the cards stuck in queues on the board. 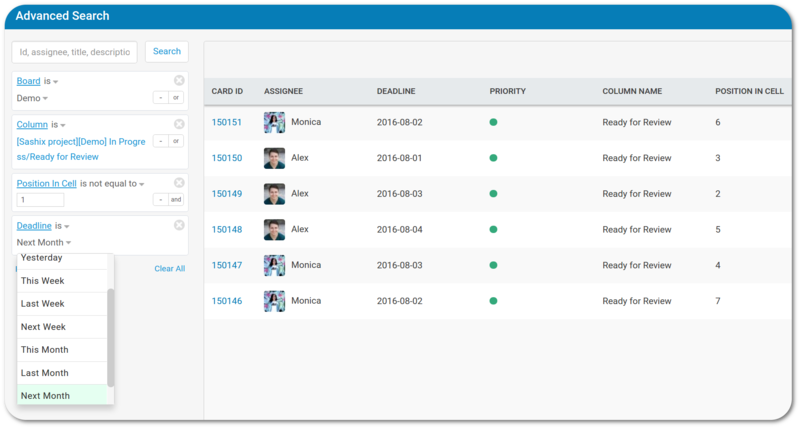 A typical example of a queue column would be one dedicated to cards waiting for a review from a Project Manager. While no one is working on the cards, their cycle time increases in the “Ready for Review” column and slows down the process. 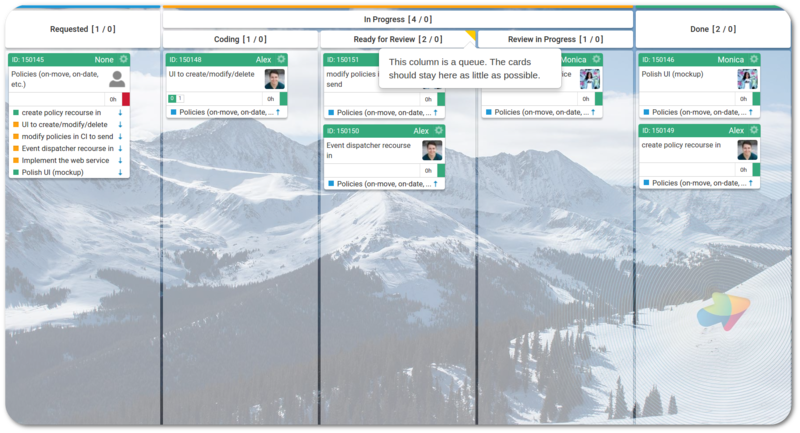 The queue columns are going to appear on your boards with a yellow tab in the top corner and can be labelled through the Edit Board panel of each board. Thought your card descriptions and comments were just for writing and tables? These areas of Kanbanize used to accommodate only text and code but have been enhanced to be compatible with images as well. Copy &paste or drag images directly into your card’s description and comments (only drag-n-drop for Ubuntu users) to be as visual as possible in your work and your communications from cards. The images located in the descriptions and comments of your cards are separate from attachments and can be sent as parts of emails from your cards in Kanbanize. Email notifications are a vital part of keeping your process in Kanbanize under control. That’s why our new Version 5.1 comes with the addition of more options regarding the way you receive them and in what format. Using the personal notification settings of your account, you can set up your email notifications to arrive to your inbox aggregated in a combined email at a convenient interval of time that fits the way you work. The notification settings are configured globally per user and will be valid for updates from all boards and projects within the account to which the user is assigned. Email notifications will now also be available in a shorter format option, containing only the essential card details. The new notification settings will not apply for mentions and your in-app notifications, which will continue to arrive in real time. Your Kanbanize dashboard is about to become a lot more colorful with Release 5.1. 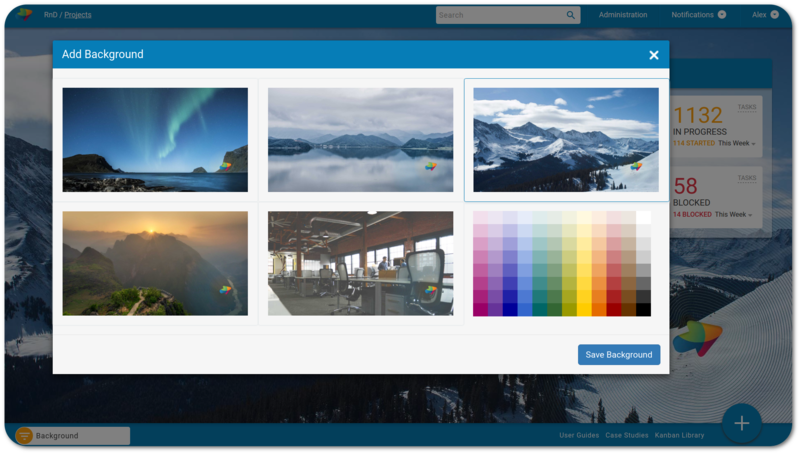 You can choose to add a wallpaper to your account from a selection of photography and a rich palette of color varieties. To change your background, use the additions button on your Main Dashboard and click “ADD BACKGROUND”. Choose your favorite and enjoy the new look of your account. This month, we are also introducing the brand new, handy Kanbanize plugin for the most recent versions of Google Chrome. 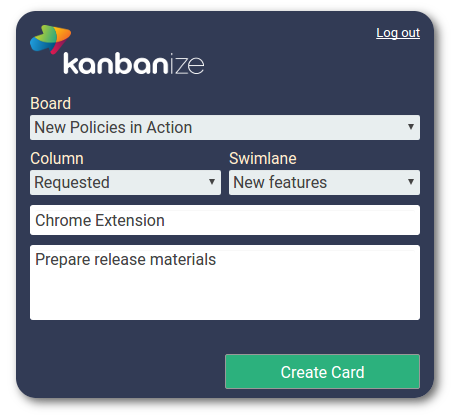 It can be found in the chrome web store and will enable you to create cards in the Kanbanize board of your choice without having to enter your account through the desktop or mobile app. Add it to your browser through the Chrome Web Store and use it as a shortcut to map your process on a day-to-day basis. In the Advanced Search, the new Position in Cell filter we are adding this release will be able to show you the order of your cards in each of the cells on your board in the format: Position 1, 2, 3 etc. This will prove very useful for situations in which you might be updating external stakeholders about the progress of cards on your boards to show them what’s coming up next in your queue. When you look for time-based information in the advanced search, you will be able to filter based on three new criteria – Yesterday, Next Week and Next Month. The addition of the yesterday filter can generate all the cards you updated on your boards the previous day and make your daily stand-up meeting a breeze. The Next Week and Month filters, on the other hand, will prepare you for your upcoming deadlines by generating a comprehensive list of what is on the horizon. 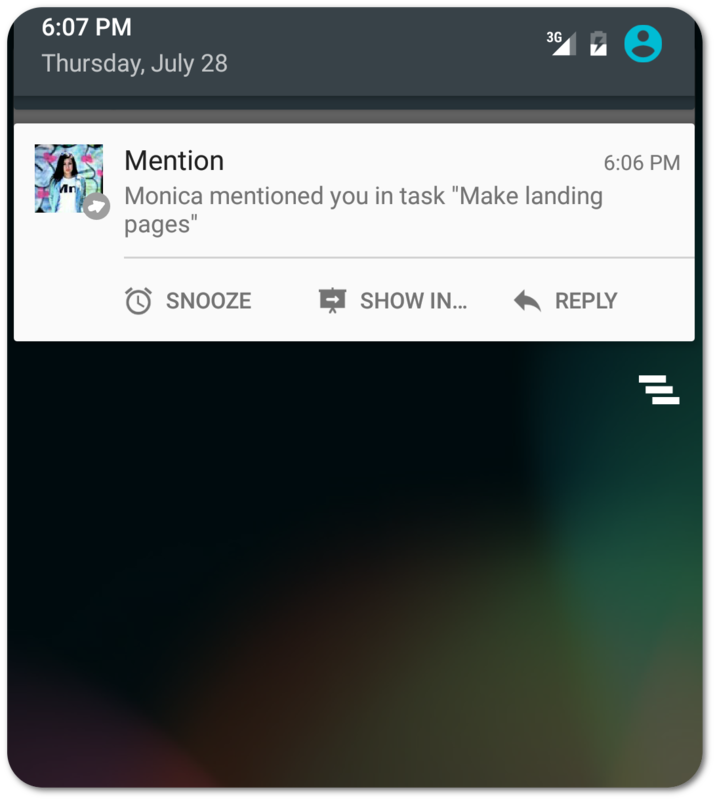 Getting @mentions through our mobile apps is becoming an even more actionable event with every release. The push notifications for @mentions in iOS and Android introduced in 5.0 now feature a reply option, allowing users to respond directly from the push notification itself. Mentions in the cards on our mobile app will also briefly flash yellow to help you navigate through tasks with many comments where your name might be featured. To mention others, begin typing @user and an auto-complete list of all the usernames in the account will help you reach your teammate faster. The tags in both mobile apps get updated as well. They are easier to edit and have a new fresh look. In order to avoid multiple copy & paste operations, newly-created child cards will now take on the title and description of their parent cards. Happy Kanbanizing with Release 5.1!